Strawberry Ridge is one of many 55 and older communities in the Tampa Bay area. But, once you visit, it won’t take you very long to see for yourself why it’s one of most popular retirement communities in the region. StrawBerry Ridge is a welcoming 55+ community featuring affordably priced manufactured homes, two modern clubhouses with lots of amenities, and a host of activities that give our residents plenty of opportunities to have fun, stay active, and enjoy retirement. Becoming a resident of StrawBerry Ridge means joining a tight-knit community where it’s possible to lead the active retirement lifestyle that you’ve always dreamed of. In fact, StrawBerry Ridge isn’t just a place to live. It’s also a mindset centered on being able to do the things you love in an age-restricted and professionally managed residential setting. One thing we that have in common with other 55 and older communities in the Tampa Bay area is convenient access to beautiful beaches, world-class saltwater fishing, professional sport venues, quality art museums, zoos, aquariums, theme parks, and many other excellent attractions. 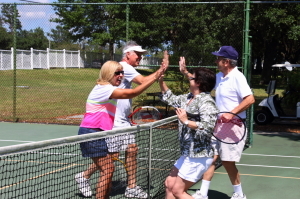 Contact StrawBerry Ridge if you’d like to schedule a visit to our 55+ community near Tampa.